A team of researchers from NASA and several other institutions in the U.S. and Europe has found evidence of ice melt accelerating in some western parts of Antarctica. In their paper published in the journal Cryosphere, the group describes the new technology they used to study ice melt in Antarctica and what they found. As the planet continues to warm, and humans continue to pump greenhouse gases into the atmosphere, scientists are finding more climatic, geographic and biologic changes that are taking place. One of those changes is ice melt in the colder parts of the planet, including Antarctica, of course. In this new effort, the researchers used what they describe as cutting-edge technology to process multiple thousands of images from satellites and used the data to chart ice-sheet motion with more precision than other technologies. The images produced by the new system show ice-sheet movement using colors—from reds to yellows—the lighter the yellow, the faster the ice was seen to move. The researchers noted that several parts of western Antarctica are experiencing acceleration of ice loss, rather than the consistent ice loss seen on the eastern parts of Antarctica. In practical terms, this means that each year, less ice that melts in the summer is replaced by winter snows, leaving less ice in total—and the pace of this process is speeding up. They note also that this is particularly alarming because prior research has shown that much of the ice in the western part of Antarctica is unstable, which means that large swaths could slip into the sea, causing a dramatic and relatively speedy rise in worldwide ocean levels. If the whole western ice sheet goes, they further note, the world could see ocean levels rise as much as three meters. Some of the areas identified in the new images are the same parts of western Antarctica that have made headlines in recent years as major calving events have occurred, highlighting changes taking place. An increase in calving, the researchers note, can be problematic, placing large regions of ice at increasing risk of melting. Antarctica is well below freezing nearly everywhere nearly all of the time. It's not melting. I hope I do not hurt any feelings by saying I believe the professional scientists over some anonymous internet poster. Political prejudice is a terrible basis for making scientific conclusions. gkam, the other commentators remind me of the old skits about the boastful little boy. Who was double-dared by his friends to walk through the graveyard at midnight. Reluctant but determined not to be called yellow by the other boys. He sneaks in. As he gets further inside, his vivid imagination begins to play tricks on him. He mutters "I ain't afraid of no spooks!" Then he starts to whistle, cause everyone knows, ghosts can't stand whistling. Frighten of the imaginary spirits hounding him. He rushes forward for the exit. When he suddenly trips over a sunken tombstone and breaks his fool neck! He was afraid of fantasies. And failed to be afraid of reality! LMAO....The only place where the AGW Cult can find GloBULL warming is exactly where there is intense geothermal activity. I challenge you --for the dozenth time, at least-- to provide a citation or link to ANY peer-reviewed study that supports your implied claim that geothermal activity is anything more than a tiny contributing factor to the accelerating melting of the WAIS --much less a MAJOR driver of the melting. The physical attributes of water, ice, and snow supports the argument that Antarctic ice is not melting. 1. 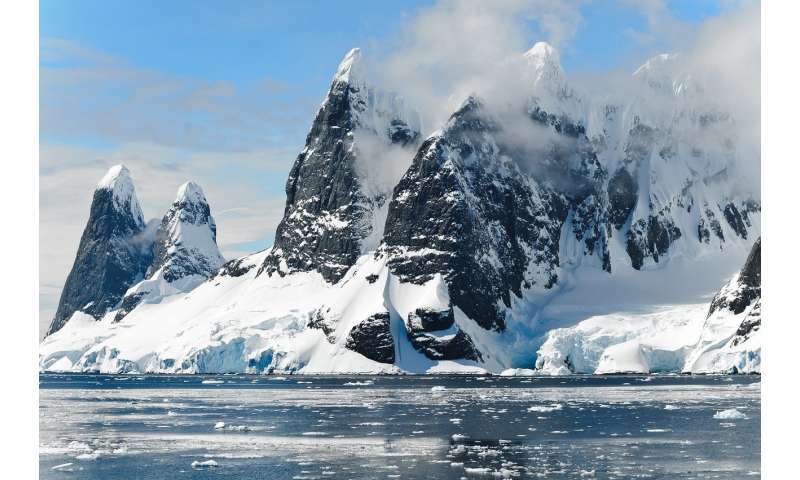 The temperatures of Antarctica have been well below freezing for millions of years. 2. The temperature of the ice can assumed to be well below freezing. 3. Snow is a very good insulator. 4. Snow reflects at least all visible light, not absorbing the heat. 5. Ice is a good insulator. 6. Substantial energy is required to heat ice. 7. In order to go through the phase transition of ice to water -0 to +0 a very substantial amount of energy is required. 8. Assume the all Antarctic ice and snow has warmed by 2 C due to GW. That isn't enough to get anywhere near melting. Ice has a very small coefficient of thermal expansion. The best we could expect is a small increase is the growth of the ice shelves. Is there a flaw in this argument? This article cites professional scientists, @macurinetherapy. Deniers aside, this is not good news. If the WAIS goes, sea level rise will affect the global economy along the coasts, areas where a majority of the economic activity in the world occurs. Strange, I coulda swore that there were numerous predictions that our coastlines would be many feet underwater by now. Oh well, past predictions are memory holed for new ones. GW is a non-falsifiable theory that showers money upon 'right' thinking scientists by governments who love the idea of a 'scientific' reason to expand their power over the prols. Being that the preponderance of the WAIS is below sea level and ice shrinks as it melts, how much new beach front property will be available? Both Poles work in tandem of each other.. as does the weather patterns.. With the rise of temperatures across the Arctic this winter, we may very well see a up-tic of melting on the southern pole as well. 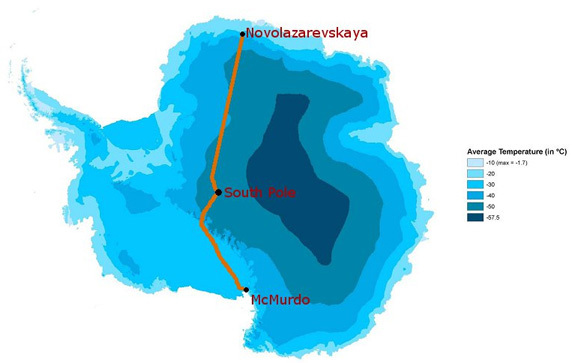 More relevant research & real time monitoring of the southern pole needs to be done. We need satellites monitoring both poles. It will get worse before it gets better. Since it appears that you suffer from a severely compromised memory, why don't you see if you can locate any first-person quote from any climate scientist making such a claim? Can't or won't do it? But the original paper title is: "Increased West Antarctic and unchanged East Antarctic ice discharge". Stop fooling people!! Has anybody noticed how Deniers are the same folk as Birthers and those who fell for "WMD!"? Well gkam the cranks are busy cranking up their deceptive agitprop campaign denying reality. They lack the competency to upgrade their ignorant ravings when faced with empirical evidence. ."... he's also a very self-assured man. Arrogant even. I'd wager he imagined that his planning was quite thorough. Even if he did consider the possibility of error he would have dismissed it as impossible. A man like him doesn't make mistakes. ..."
An accurate description of the condone-mongers infesting these comments. Political prejudice is a terrible criterion for evaluating science, . . or any part of reality. Have any of the mathematically impaired critics even looked at the paper or read this paper at https://www.the-c...018.pdf? Don't bother it contains statistics, calculus, and vector algebra. It does not address the physical attributes of ice. Being ice flow rate is a key component of the paper; it seems that at least the plasticity or flow rate relative to overhead weight would have been figured in. Rather complex paper, which I did not try to understand in detail. "1. The temperatures of Antarctica have been well below freezing for millions of years." If you read the article, you'll see they're talking about West Antarctica, where it definitely has not been well below freezing for millions of years. It should be pretty obvious that the ocean on these coasts is not below freezing in the summer time. I mean, you can look at the pictures -- see that open water? Not freezing. The ice flows downhill, into the sea. There, it melts, or it breaks off, is carried away, and melts. "Antarctica hits record high temperature at balmy 63.5°F"
Hmm. Kinda seems like some parts of Antarctica have *not* been below freezing for all of the last few million years. Either that, or our thermometers are *really* off. OK, however context is needed. "The heat record for the broader Antarctic region, defined as anywhere south of 60 degrees latitude, was 19.8°C (67.6°F) on Jan. 30, 1982 on Signy Island in the South Atlantic". Note it is 60 degrees S latitude (far N) and is an island. It really shouldn't count as representative of the Antarctic land mass. In all likelihood the Antarctic Circumpolar Current went below 60 degrees and allowed more temperate waters and air in. "And the warmest temperature recorded on the Antarctic plateau, above 2,500 meters (8,202 feet), was -7.0°C (19.4°F) on Dec. 28, 1980, it said." This is an extreme, not the average, and it is still below freezing. Such a temporary extreme is not going to effect that ice. Please see my first comment. Part of the point I tried to make first comment was that the ice is not really affected by surface temps. In all likelihood it is the same temp at the far point of the ice shelf as it was when it left the land. A Chicken Little Jackass brays above. I've already read this article. If you had, you would know that nowhere does it attribute geothermal heat as the primary --or even a significant-- driver of accelerating melt for the WAIS. The fact is, your stupidiosity is unabashed. IOW, you are too stupid to even understand that you are stupid. Try breathing through you nose for a change. "A Chicken Little Jackass brays above." Goaticle, please go back to Stormfront. This is a crock. It does not. It shows spring is coming that's all. How can they sleep at night lying like this? This article is based on a study that compiled ice flow data from 2013 to 2015 in comparison to a similar study of ice flow using data from 2008.
Who would make such a simplistic comment other than a simple. https://www.theguardian.com/environment/2018/feb/27/arctic-warming-scientists-alarmed-by-crazy-temperature-rises?CMP=Share_iOSApp_Other An alarming heatwave . My only concern with this article is it cites M. Mann, a rather biased vested interest in promoting AGW and CC. 88% of floating ice is below waterline. Ice shrinks 8% when it melts. That yields a net volume increase of 4%. Hard to get to scared of the WAIS melting. Somebody doesn't understand Archimedes' principle. Please check up on it and then come back and apologize for presenting completely made-up numbers. I don't see this even in light of considering displacement. Simplified. consider the entire mass of ice under water. It would still lose 8% of its volume. Where is the error? Thanks? This is well illustrated by the Labrador and Scandinavian peninsulas. I would expect this might have as significant an effect on sea lever rise as ice melts. However, this could be a net zero impact as other areas sink back to post glaciation levels. Gaia is always hiding in the weeds. That is many complex systems have an equilibrium, like a strange attractor. While I don't know if this is significant, water reaches is highest density and lowest volume as it goes to 4 C. The change between 0 C and 4 C is .015%, however that is relative to the volume of the oceans. So you have floating ice, but somehow only the part that is underwater melts, the above water part remains as ice and remains above the water's surface?